The work of former Lawrence University art professor Thomas Dietrich and his wife, Margaret Rappe Dietrich, opens Lawrence’s Wriston Art Center Galleries new summer exhibition series Wednesday, July 30. Thomas Dietrich’s “Fox River Mill” will be among the paintings featured in the new Wriston Art Center Galleries summer exhibition series. The series is designed to engage the Fox Valley community in a conversation about artworks and artists of the Midwest. The inaugural exhibition runs through August 17. An Appleton native, Tom Dietrich was a professor of art and later artist-in-residence at Lawrence from 1944-74. 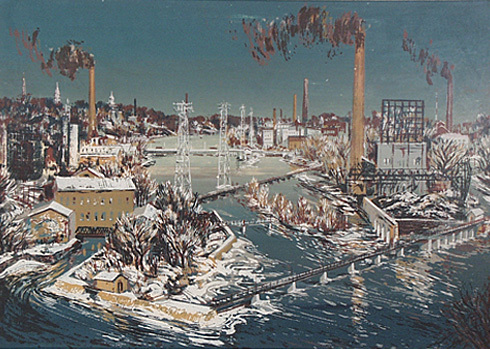 During a career spanning seven decades, Dietrich was best known for his watercolor paintings of the people, paper mills, bridges and landscapes of the Fox Valley. He died in 1998. Margaret Dietrich grew up in Chicago and graduated from Lawrence in 1936. Like her husband, the Fox Cities were a favorite subject matter. She frequently captured Appleton’s Lutz and Pierce parks, as well as other local scenery, through her oil and watercolor paintings. Beyond the 45 works exhibited at the Wriston Galleries, a map will be available that identifies other Fox Cities locations where the Dietrichs’ work can be seen, including the History Museum at the Castle and the Paper Discovery Center. The Wriston Art Center galleries are free and open to the public Tuesday-Friday from 10 a.m. – 4 p.m. and Saturday-Sunday from noon – 4 p.m. The galleries are closed on Mondays. For more information on the exhibition, call 920-832-6890.